Just want the promo code for UberEATS NZ? Use eats-amiriagui to get $10 off your first order! This UberEATS code works New Zealand wide (UberEATS currently operates in the following NZ cities: Auckland, Christchurch, Dunedin, Hamilton, Tauranga, and Wellington). Enter this UberEATS discount code when you use UberEATS for the first time, and get NZ$10 off your first order. Below is my UberEATS review, after using the service for approximately six months in Auckland, New Zealand. 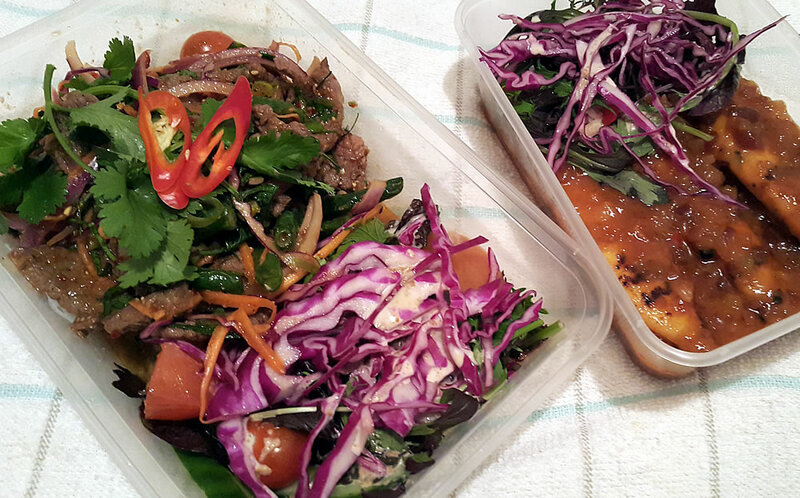 UberEATS is a delivery service, where local drivers use their own cars to deliver food from restaurants to you. It is managed via an app that is downloaded to your phone. The app shows you all the food places that UberEATS services in your area. I signed up when I was sick and needed to get a meal on the table for my daughters. Since then, I have discovered many unexpected benefits to using UberEATS that I hadn’t previously considered – hence this UberEATS review. There are, of course, some disadvantages, which I will outline too. 1. It encourages you to try a much wider range of restaurants. I tend to drive the same routes most days, dropping my daughters at school. There are many local eateries that I never drive past and/or don’t know exist. There are other places that I see, but, for various reasons, decide not to enter (for example, they may look unappealing, or have bad parking / poor access). The UberEATS app exposes you to a wide range of new restaurants in your area. In addition to the fast food restaurants that you might expect (MacDonalds and so on), UberEATS has almost every genre covered. As a consequence, I have discovered some of the most amazing restaurants near me. 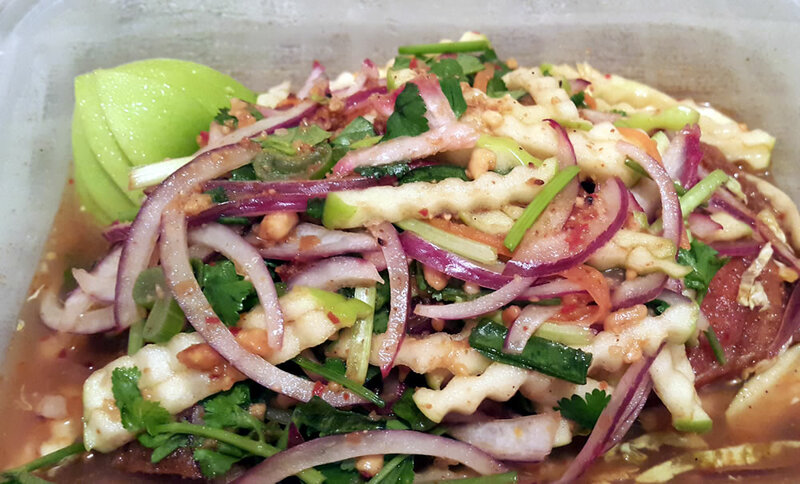 This dish, for example, from Nine Thai Cuisine, in Te Atatu, Auckland, is delicious. It has a large salmon steak buried under a salad of granny smith apple, red onion, coriander, and a million other fresh ingredients, in a hot/sweet/sour dressing. I didn’t know this restaurant existed until I signed up for UberEATS. It is now perhaps my favourite dish in the world. It costs $17. Aari Puri, owner of Boy & Bird in Ponsonby, said they are so busy the UberEATS app often has to be switched off for periods during peak times throughout the day. He also now has a dedicated manager at weekends to deal solely with Uber deliveries. 2. You don’t have to pay for parking or battle traffic. When I was younger, this wouldn’t have been so much of an issue…but with young children, the last thing I want to do after a long day is drag the kids out to the car, drive somewhere, find a park, drag them inside a restaurant and make them sit while food is cooked, then drive back with them tired in the back. I initially thought paying for food delivery was a luxury I couldn’t justify, but it eliminates all of the pain described above. We use UberEATS on a weekly basis now, and I couldn’t be happier. 3. The rating system allows you to clearly gauge the quality of the food. Unlike other online rating systems, which are easily manipulated (such as Facebook reviews, for example), ratings on UberEATS can only be placed directly after purchasing a meal via the app. You get to rate the driver (thumbs up / thumbs down) and the restaurant (out of 5 stars). As such, the ratings are pretty reliable. Anything rated above 4.5 stars is almost certain to deliver an excellent meal. 4. It has an easy-to-read the menu. Many restaurants have menus that are long, hard to read, with unclear pricing. 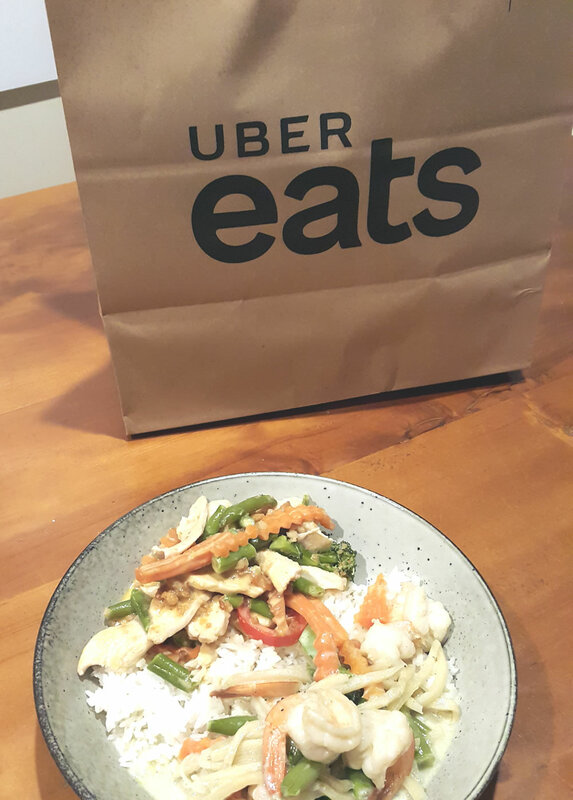 UberEATS forces all restaurants to use the same system: everything is clear, with many dishes accompanied by professional photographs of the item. The ordering and payment process is equally clear. 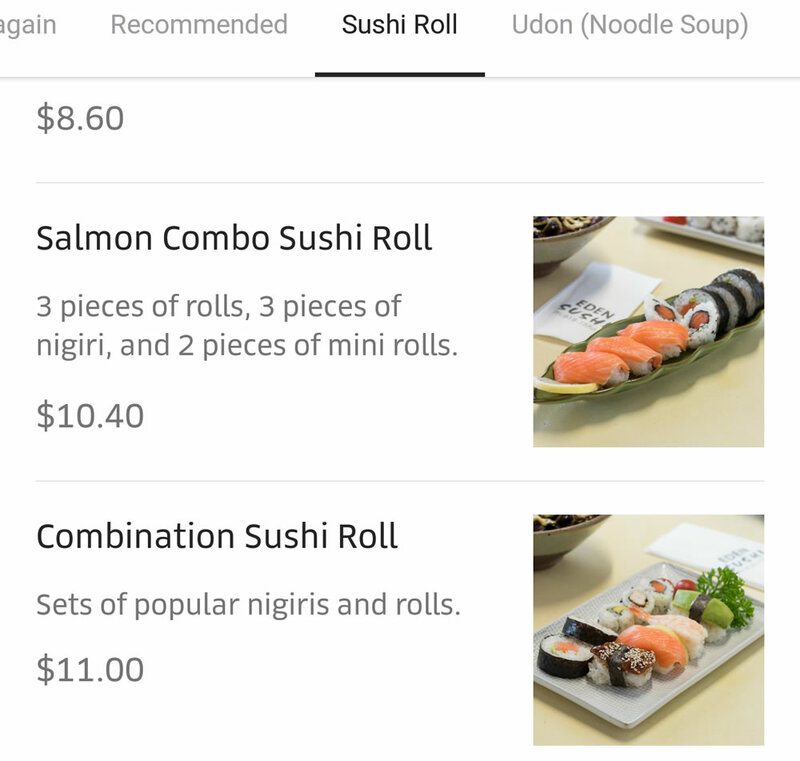 Here is an example of an UberEATS menu for a local sushi restaurant. Clicking on each item allows you to see more information and select different options for that meal. The hungry, lazy and frantically busy among us rejoiced at its arrival. The hype was real. 6. It provides me with a sturdy paper bag, ha! Food is delivered in a thick high-quality paper bag, which I use as a rubbish bag. It fits under my sink and stands up on its own. I have been looking for paper rubbish bags for ages (we used some as a kid), but now that we use UberEATS, I just use this as my kitchen rubbish bag for first half of the week. 1. It doesn’t include the council rating. In New Zealand, food service outlets are rated by the Council using an A, B, C, D, E grade, based on the cleanliness and hygiene of the outlet during random inspections. I would love it if this was included in the UberEATS app at some point. 2. I sometimes feel uneasy about collecting a delivery from a stranger in the dark. All the UberEATS drivers I have encountered have been very polite, and I have an outside light, so it is not literally dark (they deliver right to my door), and I usually order in the early evening, so this isn’t usually a problem. So far a large cross-section of people have delivered food for me. Sometimes grandmothers; sometimes middle-aged women. But, by and large, they have been young men. If you are wondering how to drive for UberEATS, this process is outlined here. 3. I wish it was a few dollars cheaper. Delivery charges apparently depend upon your location. How much does UberEATS cost for me? I am in West Auckland and the UberEATS delivery fee is $6.99 (I believe it is $5.99 in more central areas). I am on a tight budget, so this is expensive, however, in my case, it’s worth it, as I have young children and my spare time is precious. I can justify it for one night a week. On your phone, search for the free UberEATS app. For example, on Android, I visit the Play Store and search for UberEATS. Follow the sign-up process as prompted. Add all the information, as required, including your credit card details, which are used for payment. 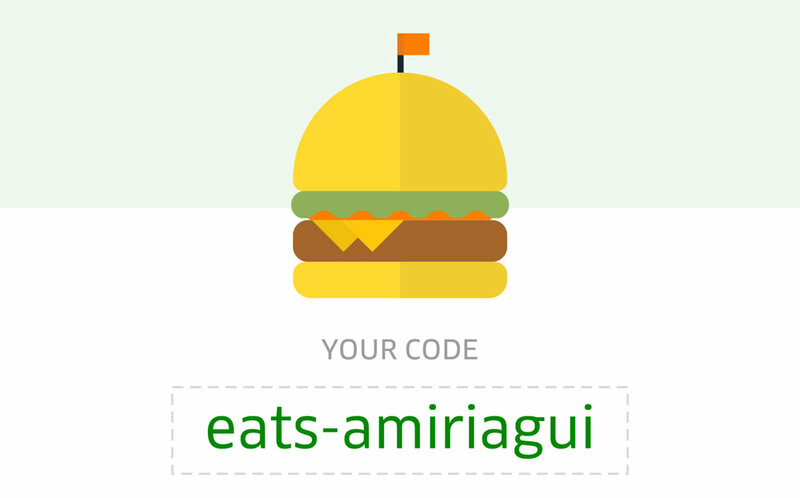 IMPORTANT: Use this UberEATS promo code (New Zealand) to get $10 off your first order: eats-amiriagui. This UberEATS coupon or voucher is valid for new users to UberEATS only. Make an order and wait for your food to arrive! Another delicious UberEATS discovery: Mix Moon Restaurant, New Lynn. Rated at 4.7, their meals are amazing. They are outside of my normal budget, but their food is full of beautiful, fresh ingredients. So good! How do you pay for uber eats? Money is taken from your credit card once the food has left the restaurant. Does UberEATS take cash? No, you cannot pay cash for UberEATS. Are you supposed to tip UberEATS drivers? In some countries, people can tip UberEATS drivers right from the app. This doesn’t happen in New Zealand, as tips are not expected. Can you order from two places on UberEATS? You can, but you pay for delivery twice. You also have to make sure that you have enough money on your credit card to pay for both orders, as they are only charged once they leave the restaurant. Does UberEATS come to your door? They come down my driveway, and I walk out to the car to meet them. I’m not sure if this is how it typically works! What NZ cities have UberEATS? At the moment, the following New Zealand cities have UberEATS: Auckland, Christchurch, Dunedin, Hamilton, Tauranga, and Wellington. You can see the up-to-date list here. How to get uber eats for free? There is no way to get UberEATS for free, as far as I am aware, however, once you sign up, you are provided with your own voucher code, similar to the one I have shared above. If a new user signs up using your code, you get $5 off your next order. If enough people use it, you could have free UberEATS. Bonus! I don’t usually write reviews, but this is a new experiment. l do so only when I like a product, have used it extensively, and there is an incentive for me. Hope you found it helpful! This website has been created by Amiria Gale and contains artwork as well as unrelated ramblings. Amiria has been a teacher of Art & Design and Curriculum Co-ordinator in Auckland schools. She has a Bachelor of Architectural Studies, Bachelor of Architecture (First Class Honours) and a Graduate Diploma of Teaching. 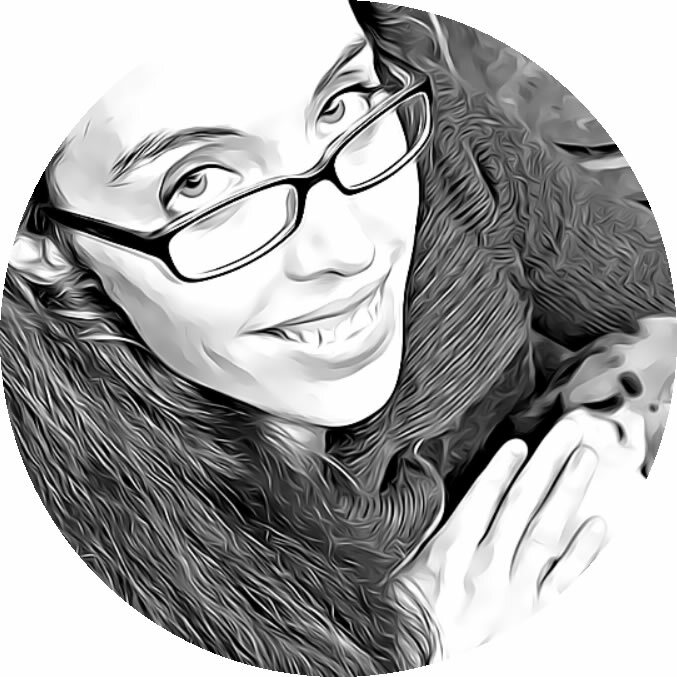 Amiria now runs the Student Art Guide, a website dedicated to helping high school Art students excel.